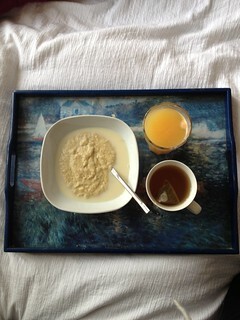 If I would be allowed to eat only one kind of food my entire life, it would probably be porridge. Not just because I know many, many, many ways to prepare it, but also because it is healthy, cheap, filling, easy to find and… Just awesome. Aren’t you convinced? 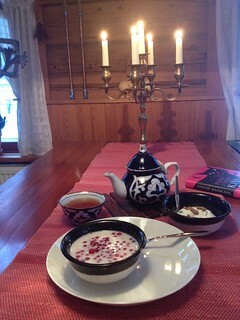 Let me introduce you seven ways to have a porridge. Best oats are steel-cut, I mean the ones with big flakes. Price-wise, I strongly recommend though upgrading from the cheapest available ones (in Germany 0,39 €/500g Lidl/Netto/Rewe) oats to at least the 1 €/500g -class, the difference in taste is definitely worth the “splurge” The best ones are of course Elovena. Finnish girls at my workplace are famous transporting and asking these to be transported from Finland. Shortly, I guess it is the same kind of relationship we have with Elovena as many Nordic guys have with their snus. If you use lots of cinnamon, I recommend using ceylon cinnamon which has lower coumarin contents in higher amounts. Propably this is just a better-safe-than-sorry-thing. Best is kosher salt or himalayan salt. Why? Less added stuff, and generally a healthy trend thing. Nevertheless, I am all in. I personally prefer water, because: 1. it is always available 2. I don’t need to drag it to the 4th floor 3. It is free. Milk of your choice: You can choose any kind of milk you wish. Dairy (normal milk) increases insulin levels rapidly and helps to bind fat, which is not usefull if you are trying to loose weight (calory is not a calory etc, let’s get to this topic some other time). Especially hazelnut, rice and cocos milks add a nice flavour, but also some sugar. The ultimate-healthy-choice but also the most expensive one is unsweetened almond milk. Put oats to a large bowl. Pour boiled water on them. Mix. Add cinnamon. Ready while you walk from the kitchen to your workspace (5 meters). Believe me, this works. If you want some luxury, add an apple/banana/pearl. Yes yes, just talked about dairy and stuff, actually haven’t had this this year but it is good. And why this is called Nordic edition? Just because haven’t seen rye oats, lingonberries or wild blueberries in normal stores here in Berlin, and some things are just different down here, but cottage cheese is absolutely just better in Nordics. No need to negotiate. Cook water, add oats and salt, cook slowly. Top with cottage cheese, berries and dairy milk. One of my absolute all-time-favorites! Boil water, add everything else, cook slowly until 10 minutes. If too hot, add some milk of choice. Boil water, add oats and salt, cook medium-heat for 10 minutes. Top with sliced banana, walnuts and honey or marple syrup. Yes, I might have had this… A couple of times. When I had quite low-energy-evenings, I might have had this as dinner as well. 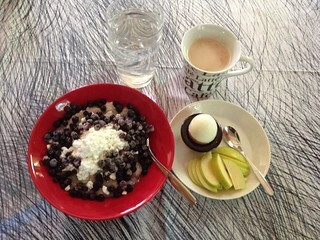 When I had very low-energy evenings, I might have had a mix of this recepy and post-workout morning porridge, meaning mixing just buckwheat oats, boiled water, protein powder and a bit more water in a bowl. Don’t recommend as a long-term dinner solution but I guess people have done and eaten worse things. Boil water, add oats, cook until done. Add protein powder, mix, add non-sweetened almond milk, and the temperature is just right to eat immediately. I came up with this kind of recepies in instagram, and wow, adding veggies and an egg to the porridge is a really, really good idea. This is one of my current favorites. You barely taste the zuccini, and adding an egg adds protein and fats to the portion, which helps you to feel full longer. Boil water, add oats, add salt. Cook five minutes. Add grated zuccini. Cook about four more minutes. Add raw egg to the almost ready porridge and mix until egg is cooked. This I have had lately… Many, many, many times. Actually so many, that I won’t have this tomorrow. Payday edition: no coconut oil but with almond milk, enjoyed with green tea and extra magnesium. Boil water, add oats, add salt. Cook five minutes. Add grated carrot and lemon zest. Cook about four more minutes. Add raw egg to the almost ready porridge and mix until egg is cooked. Top with some coconut oil and coconut if wished. Not yet fully convinced? Oh well. Add any of these recipies cardamon and you get a new twist. Add any berries. Add yoghurt. Add yoghurt and avocado, that works as well. There is also the whole world of oven-baked porridges. And you know what? This was only the winter edition. You can be sure, that there will be ediiton two with one million types of overnight oats. Until then, happy cooking!